Landscape Architecture is defined by dictionary.com as "the art of arranging or modifying the features of a landscape, an urban area, etc., for aesthetic or practical reasons." There are many aspects that go into some landscape architecture, such as environmental, social, and even sociopolitical issues. Landscape architecture plays a role in environmental and social issues when people create architectural designs for structures that help tackle problems like clean air, nature and wildlife preservation, helping communities in need of homes and/or food and water, and much more. 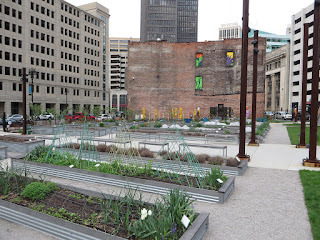 "there are 165 acres of urban gardens and farms under cultivation in Detroit, Michigan. In a tour, Ken Weikal, ASLA, co-founder of the non-profit GrowTown and the firm Ken Weikal Landscape Architecture, explained that everyone from Capuchin Monks to non-profit cooperatives, university labs to self-sufficient farmers, corporations to small businesses are involved in using Detroit’s vacant lands to produce food. The goals of these efforts are to increase food production “for Detroiters and by Detroiters,” generate new sources of income, and build community. The grand, long-term vision: “food sovereignty” for this resurgent rust-belt city." Landscape architecture is extremely valuable and helpful to many different communities, cultures, the environment, and our world. We are a boutique firm providing exceptional customer service for all of your Architectural Drafting, Structural and Civil drafting needs.With over 20 years experience we are here to help you through all of your planning requirements.